Funmi Peters was born in Nigeria, with eight other siblings. In her younger age, Funmi studied art and dress construction in Nigeria and Ghana. Since studied in the same field, Funmi took special interest in knowing and learning more about crafts, daily and family life of our producers. This special bond held on and grew more and more over the past 9 years, when she found love and moved to Sweden. 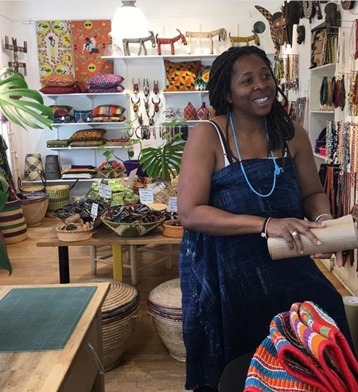 "I couldn't stop thinking of all those people I have worked with over the years, the idea of starting my own clothing line with African fabrics came up and in this way I could travel on my buying trip, visiting these people and buy directly from them". Helping to sell the produces I buy from them and pay directly as much as possible without a middle man in between. Colours of Africa is a shop with a mixtures of products from different parts of of Africa, showcasing the day-to-day use of items in Africa. Our goal is to support women and children, in Africa. It's the women that takes the most responsibilities of the household and care of children, We at coloursofafrica think that supporting women will also gives opportunities to the children to be independent individuals. Funmi takes her trips and semester in Africa, traveling ones or twice in a year buying , sourcing and hand picking products for the shop.